The Supreme Court has thrown open the Sabarimala Temple to all woman of all age groups. CJI Dipak Misra, Justice RF Nariman, Justice DY Chandrachud wrote separate judgments, but all held that woman should not be denied entry to the temple, which is the shrine of Celibate God Ayyappa. Interestingly, the lone woman in the bench, Justice Indu Malhotra, is the sole dissenter to the majority judgment. 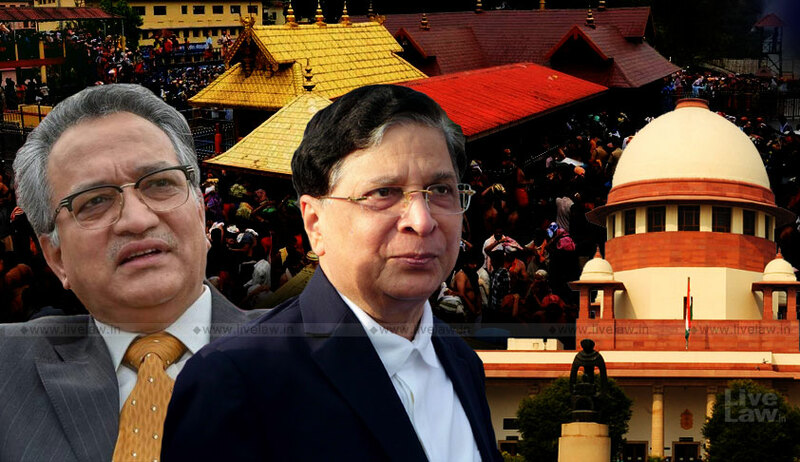 Chief Justice of India Dipak Misra observed that exclusionary practice (denial of entry to women in Sabarimala) is neither an essential nor an integral part of the Hindu religion without which Hindu religion, of which the devotees of Lord Ayyappa are followers, will not survive. In short, the CJI holds that devotees of Lord Ayyappa do not constitute a separate religious denomination. He also observed that the right guaranteed under Article 25(1) has nothing to do with gender or, for that matter, certain physiological factors specifically attributable to women and the denial of entry to the temple denudes them of their right to worship. More than half of the 95-page judgment deals with submissions of the parties, interveners, Devaswom Board, State and amicus curiae Raju Ramchandran and K Ramamoorthy. The following are some observations made by CJI in the judgment with which Justice AM Khanwilkar also concurs. Referring to Shirur Mutt case, the CJI observed that the most important condition for a religious denomination is that the collection of individuals ought to have a system of beliefs or doctrines which they regard as conducive to their spiritual well-being. He observed that there is nothing on record to show that the devotees of Lord Ayyappa have any common religious tenets peculiar to themselves, which they regard as conducive to their spiritual well-being, other than those which are common to the Hindu religion. Therefore, the devotees of Lord Ayyappa are just Hindus and do not constitute a separate religious denomination. For a religious denomination, there must be new methodology provided for a religion, the CJI said. The CJI also observed that, by allowing women to enter into the Sabarimala temple for offering prayers, it cannot be imagined that the nature of Hindu religion would be fundamentally altered or changed in any manner. The court also observed that the Devaswom Board had accepted before the high court that female worshippers of the age group of 10 to 50 years used to visit the temple and conducted poojas in every month for five days for the first rice feeding ceremony of their children. It had also taken a stand that restriction of entry for women was only during Mandalam, Makaravilakku and Vishu days. These are the conclusions in the judgment. Important points are highlighted for quick reading. In view of the law laid down by this Court in Shirur Mutt (supra) and S.P. Mittal (supra), the devotees of Lord Ayyappa do not constitute a separate religious denomination. They do not have common religious tenets peculiar to themselves, which they regard as conducive to their spiritual well-being, other than those which are common to the Hindu Lord Ayyappa are exclusively Hindus and do not constitute a separate religious denomination. Article 25(1), by employing the expression 'all persons', demonstrates that the freedom of conscience and the right to freely profess, practise and propagate religion is available, though subject to the restrictions delineated in Article 25(1) itself, to every person including women. The right guaranteed under Article 25(1) has nothing to do with gender or, for that matter, certain physiological factors specifically attributable to women. The exclusionary practice being followed at the Sabarimala temple by virtue of Rule 3(b) of the 1965 Rules violates the right of Hindu women to freely practice their religion and exhibit their devotion towards Lord Ayyappa. This denial denudes them of their right to worship. The right to practice religion under Article 25(1) is equally available to both men and women of all age groups professing the same religion. The impugned Rule 3(b) of the 1965 Rules, framed under the 1965 Act, that stipulates exclusion of entry of women of the age group of 10 to 50 years, is a clear violation of the right of Hindu women to practise their religious beliefs which, in consequence, makes their fundamental right of religion under Article 25(1) a dead letter. The term 'morality' occurring in Article 25(1) of the Constitution cannot be viewed with a narrow lens so as to confine the sphere of the definition of morality to what an individual, a section or religious sect may perceive the term to mean. Since the Constitution has been adopted and given by the people of this country to themselves, the term public morality in Article 25 has to be appositely understood as being synonymous with constitutional morality. The notions of public order, morality and health cannot be used as colourable device to restrict the freedom to freely practise religion and discriminate against women of the age group of to 50 years by denying them their legal right to enter and offer their prayers at the Sabarimala temple. The practice of exclusion of women of the age group of 10 to 50 years being followed at the Sabarimala Temple cannot be regarded as an essential part as claimed by the respondent Board. In view of the law laid down by this Court in the second Ananda Marga case, the exclusionary practice being followed at the Sabarimala Temple cannot be designated as one, the non-observance of which will change or alter the nature of Hindu religion. Besides, the exclusionary practice has not been observed with unhindered continuity as the Devaswom Board had accepted before the high court that female worshippers of the age group of 10 to 50 years used to visit the temple and conducted poojas in every month for five days for the first rice feeding ceremony of their children. The exclusionary practice, which has been given the backing of a subordinate legislation in the form of Rule 3(b) of the 1965 Rules, framed by the virtue of the 1965 Act, is neither an essential nor an integral part of the religion. A careful reading of Rule 3(b) of the 1965 Rules makes it luculent that it is ultra vires both Section 3 as well as Section 4 of the 1965 Act, for the simple pure reason that Section 3 being a non-obstante provision clearly stipulates that every place of public worship shall be open to all classes and sections of Hindus, women being one of them, irrespective of any custom or usage to the contrary. Rule 3(b) is also ultra vires Section 4 of the 1965 Act as the proviso to Section 4(1) creates an exception to the effect that 95 the regulations/rules made under Section 4(1) shall not discriminate, in any manner whatsoever, against any Hindu on the ground that he/she belongs to a particular section or class. The language of both the provisions, that is, Section 3 and the proviso to Section 4(1) of the 1965 Act clearly indicate that custom and usage must make space to the rights of all sections and classes of Hindus to offer prayers at places of public worship. Any interpretation to the contrary would annihilate the purpose of the 1965 Act and incrementally impair the fundamental right to practise religion guaranteed under Article 25(1). Therefore, we hold that Rule 3(b) of the 1965 Rules is ultra vires the 1965 Act.